A Lorax statue in a Dr. Seuss sculpture garden. Whenever young Theodor Geisel stepped out the front door of his pale gray boyhood home at 74 Fairfield St. a century ago, a vibrant urban cavalcade awaited. Streetcar bells clanged. The engines of locally built Stevens-Duryea automobiles and Indian motorcycles purred. Clydesdales clomped on cobblestones as they hauled wooden barrels of beer produced at the Geisel family brewery. During summer months, young Ted explored the vast natural spaces of nearby Forest Park, and he sled down its hills in wintertime. The boy’s creative mind concocted the extraordinary from everyday life. After visits to the park’s zoo with his mother, he doodled a wild menagerie of beasts with nonsensical names on his bedroom walls. The Springfield of Geisel’s youth was a dynamic boomtown; its population doubled between 1890 and 1910. The city’s factories roared as they manufactured everything from Smith & Wesson firearms to Milton Bradley board games, Rolls-Royces to Absorbine Jr. It was a magical time to grow up in Springfield. In the ensuing decades, however, prosperity left Springfield, and so did Geisel. But even after he became known to the world by the pseudonym Dr. Seuss, the author’s childhood continued to inspire his fantastical landscapes, exotic creatures, and tongue-twisting comic verses. “Why write about Never-Never Lands that you’ve never seen — when all around — you have a real Never-Never Land that you know about and understand,” Seuss said of his hometown. The Cat in the Hat and his creator are immortalized in Dr. Seuss’ hometown. Although the city has been transformed in later decades, I set out on a recent winter day in search of the flint that sparked the vivid imagination of her native son. I start my Seussian tour with a visit to the Lyman and Merrie Wood Museum of Springfield History, which houses a permanent exhibition exploring the impact of Geisel’s childhood on his works through the juxtaposition of his distinctive illustrations and photographs of Springfield landmarks. If you go to Springfield. . . Visitors will spot the resemblance between the belching smokestacks of the defunct Springfield Gasworks and the Thneeds’ polluting factory in “The Lorax” as well as the similarity between the giant turrets of the Howard Street Armory, which look like giant rooks on a chessboard, and the castle in “The 500 Hats of Bartholomew Cubbins.” The exhibition — entitled “And to Think That He Saw It in Springfield!” — shows how the exotic onion domes that once topped Main Street’s Fuller Building, the whimsical turtle fountains that once bubbled in Stearns Square, and the curvaceous staircases of Forest Park’s Barney Mausoleum incubated Seuss’s peculiar streetscapes. One panel reveals that Seuss’s childhood was far from idyllic. The prejudice encountered by his German-American family during World War I mirrors the discrimination at the heart of his 1961 book, “The Sneetches.” The museum’s small collection of Seuss-abilia is a reminder that before Seuss hit it big as the poet laureate for generations of children, he was a successful advertising artist. The artifacts include the bust of a fanciful unicorn he sold by mail order and a Narragansett Lager serving tray featuring one of his illustrations. After exploring the rest of the museum, I walk a block east to the former Central High School, where Seuss received his first big break. When the school newspaper, the Central Recorder, published Seuss’s parody of Walt Whitman’s “O Captain! My Captain” in its Feb. 7, 1919, edition, it attracted little attention, but it marked his first foray into print. For the next two years, the initial flashes of Seuss’s creativity blazed in the newspaper’s verses and illustrations, often under a pseudonym. Condominiums have now replaced classrooms inside the mammoth yellow edifice, but once a month a small museum with artifacts related to the school, including first-edition Seuss books and other items related to the author, is open to the public. After being voted “class wit” and “class artist” and graduating in 1921, Seuss left Springfield for Dartmouth College. Sixteen years later, he had found success in New York’s advertising industry, but his dream of publishing a children’s book appeared to be dead after dozens of rejections. However, a chance sidewalk encounter on Madison Avenue with a college friend who had started a job that very morning with Vanguard Press led to the 1937 publication of his first children’s book, “And to Think That I Saw It on Mulberry Street,” in which the magical imagination of a boy named Marco transforms a mundane horse-drawn wagon into a street pageant complete with a ruby-clad rajah atop an elephant pulling a big brass band. The metamorphosis of the ordinary into the extraordinary mirrored Seuss’ boyhood experiences, and the book’s imagery evokes Springfield with red police motorcycles resembling the city’s famed Indians and a look-alike of mayor Fordis Parker. I walk four blocks from Seuss’s former high school to the setting for the first of his 44 children’s books. Fittingly, an elementary school now sits at the foot of Mulberry Street. A stone marker commemorating the book is entombed underneath feet of snow, but several of the street’s brightly colored Victorians hark back to Springfield’s heyday when it was known as the “City of Homes.” Marco and Seuss might not recognize most of Mulberry Street today, however, with its mix of apartment complexes, legal and medical offices, and buildings still bearing the scars of the powerful tornado that tore through here in 2011. A walk past the vacant lots and tornado-damaged buildings on Howard Street, where Seuss was born on March 2, 1904, makes clear that Springfield has been buffeted by figurative and literal winds over the past century. The Howard Street Armory, with its crumbling brick face and plywood-shuttered arched windows, looks like the ruins of a medieval castle. I begin to wonder whether the city that Seuss grew up in was as hopelessly buried as that commemorative marker on Mulberry Street. But then the snow begins to fly like the yuletide flakes in Whoville. The frosty cloak over the city covers the grit and restores a childlike perspective. The jagged icicles dripping from the gables of the elegant Victorians lend an otherworldly appearance. Much as it did when Seuss was a boy, Forest Park echoes with the delighted screams of children sledding in the shadows of the Barney Mausoleum, whose winding, snow-caked steps look like an Olympic ski jump. 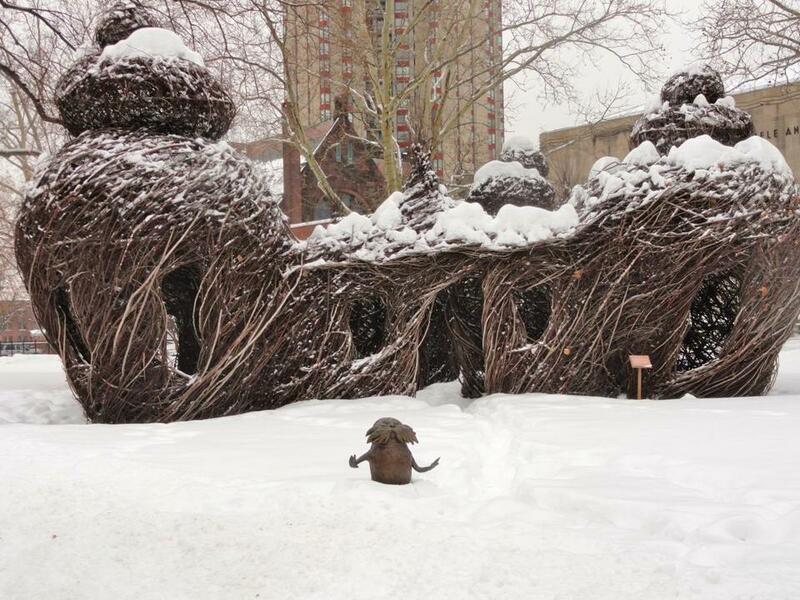 I venture to the Dr. Seuss National Sculpture Garden, in the quadrangle of the Springfield Museums complex, where some of his most beloved creations frolic in the snow. Sam-I-Am carries a side order of snowflakes on his platter of green eggs and ham as Thing One and Thing Two appear to soar into a sky like a pair of figure skaters. The Grinch smiles slyly as if he had contrived yet another storm for a winter-weary region. 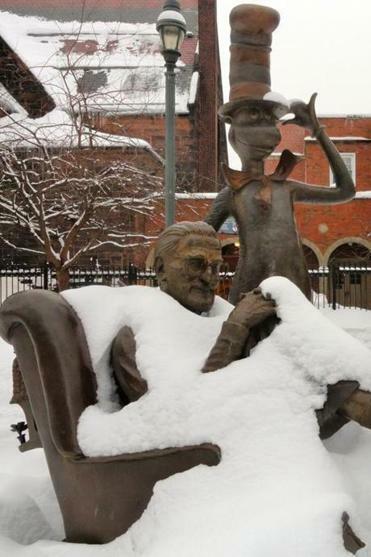 A bronzed statue of Dr. Seuss at his drawing board rests under a snow blanket next to his most famous character, the Cat in the Hat. Soon, heat beckons. I step inside the century-old Central Library at one head of the quadrangle. I walk downstairs in the Italian Renaissance Revival landmark to the children’s room. To the left of the entrance is a collection of Seussian classics, some in English, some in Spanish, all dog-eared. I realize that although the streetscapes of Geisel’s youth may be gone, his personal Springfield remains as vibrant as ever, continuing to spark imaginations. Just open the pages of one of his books. Christopher Klein can be reached at www.christopherklein.com.